Well, even almost a week after conference I’m still basking in the glow and wishing I could go back. But I’m taking comfort in the fact that hopefully I will be headed to Nashville for the 2015 conference next year! The following blog post is the first half of a two-part post on my conference experience. This first part will cover my own personal experiences and duties as a conference volunteer and “junior attendee.” In the second part, which is coming soon, I will discuss more of the pragmatic and practical aspects of conference-going (at least as I experienced them). So if you’re ready, I’m ready! AOTA Conference Recap: Part I – GO! 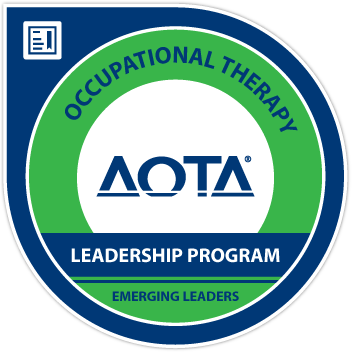 With this blog, it is my goal to add new perspectives and information to the wealth of knowledge that is out there about the wide and wonderful field of occupational therapy. To that end, I’m first going to discuss my experience as a conference volunteer – something I was unable to find ANY information about prior to attending! My time in Baltimore came to an end this past Friday, and I was so sad to leave the city and all of the awesome people I met while I was there. I have a ton of pictures and stories to post, but I’m currently trying to get caught up on all the homework and duties I left behind for three days! So while I’m busy gathering myself for the coming week and writing a post that’s coherent enough to go up here, I’ll just leave you with a few pictures I took! There are plenty more on the way, but I hope for now these will give you a taste of my experience at my first ever AOTA conference! After several hours on the road, I’ve finally made it to the beautiful city of Baltimore, Maryland! I’ve settled in for the night and I’m preparing to get up early and take in everything there is to see and do at the Conference’s first full day tomorrow. Although I couldn’t afford conference registration this year with my very limited undergraduate student budget, volunteering seems like a great way to get a taste of the conference experience and give back to the greater occupational therapy community as well. For my one day of volunteering, I get to attend the education sessions taking place in the room I’m monitoring for free. I also get the chance to be there for the keynote address – featuring several wounded warriors and my hero the Army OT Guy! Finally, I’ll also get free admission to the amazing Expo on a day of my choosing. In addition to all of these perks, I can take part in any of the open sessions being held in the new “Networking Lounge” and learn more about a variety of topics while networking with other students and professionals. All in all, I’m pretty satisfied with the opportunities that are going to be available to me and I hope to take advantage of all of them! I’ll also be trying to take pictures of the conference and my experiences there so I can have a record of my first real AOTA event. I’m not a particularly good photographer, so we’ll see how it goes. But if I get one picture with the Army OT Guy then I will consider my mission here BEYOND complete!!! On that slightly stalkerish note, I’m going to head for bed and get ready to be the AOTA’s most excited and energetic volunteer ever tomorrow! 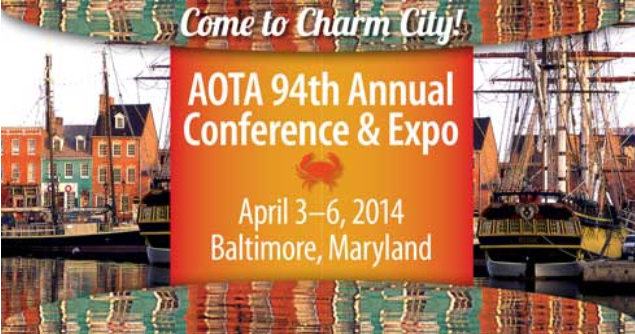 In case you didn’t know, the American Occupational Therapy Association (AOTA) Conference is happening next week in Baltimore, Maryland! When I found out about it several months ago, I applied to become a volunteer for this year’s conference. After a month-long wait, I was elated to open my email and find my volunteer assignment waiting for me! I have never attended a major professional conference before, and I am looking forward to the chance to attend this important event and see what’s happening in the wide world of occupational therapy. I’ll be volunteering at the Hospitality Booth and as a Room Monitor, and then I’ll earn free access to the Expo on Friday. It’s going to be a great trip to Charm City, I’m sure! While I’m in Baltimore, I have several goals. First, I would like to meet one of my OT role models and the person whose job I’d like to take — Captain Erik Johnson, who also goes by “Army OT Guy.” I’m so excited about the opportunity to meet and network with him, but I can’t imagine what I would even say to somebody like him. I think I might like to work with wounded warriors and veterans in the future, and his website, videos and news articles have been a constant source of inspiration to me. In case you’re interested, here’s the link to his website: http://armyotguy.com/armyOTguy.com/Welcome.html. Ultimately, I would like for him to schedule a visit to my graduate program sometime in the next year or so. He goes “on tour” and travels around the country visiting OT programs and talking to students about his experiences and expertise and I would love the opportunity to hear from him! In any case, I think it will be great to hang out with some of the first and second-year students and see the impact people in my program are making in the field. Finally, I just want to take this time off from school to relax! My final semester has been a very hectic one, and I’m glad for this mini-vacation to help break up the last semester until I graduate. A couple days at Conference and hanging out in Baltimore will be just what I need to get recharged and ready to finish my senior year strong! 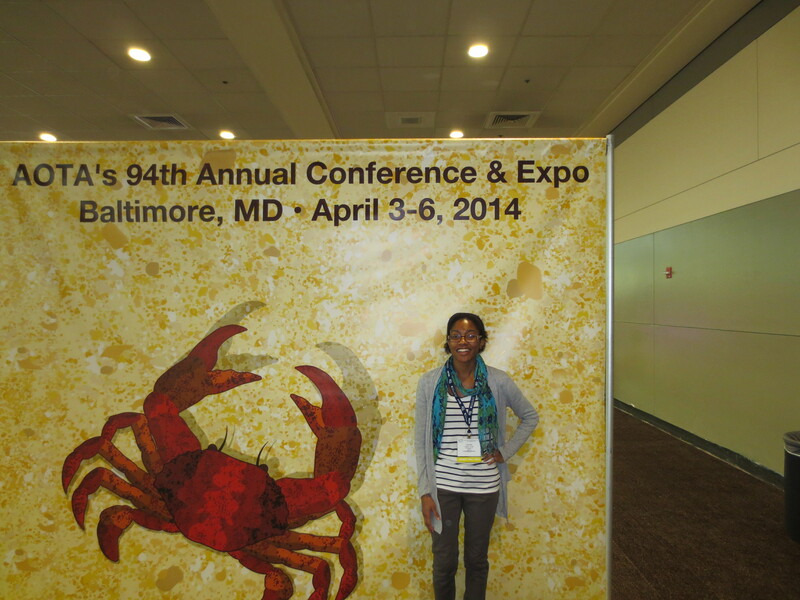 I’ll be posting next week about my experiences in Baltimore and at the Conference, so stay tuned!